Presidente, Director: Rehabilitate and Release Kshamenk back to the Wild. Save Kshamenk is a male orca about 25 years old who was captured along with three other orcas for SeaWorld animals in captivity in 1992 when he was approx. only 5 years. While Mundo Marino claims to have "rescued" from a stranding, the reality was very different, Kshamenk along with 3 other orcas from his herd, were obtained by forced stranding a catch: four whales were dragged to the shore by boats from Mundo Marino with a long net stretched between them, kept them there until the tide fell and were stranded. Killer whales were stranded on the sand and stayed there for many hours. One was returned to the sea by their captors, as it was too big and heavy to move. A second died in transit and a third crashed into the walls of the pool when it was introduced, trying out, and also died by suicide! The only survivor of the four orcas was Kshamenk. The orca was between four and six years old at the time of its removal from the wild. After being transferred to Sea World with the excuse of a "rehabilitation" was held in a pool shared with a female orca named "Bethlehem" with which he made the killer whale show for eight years. Kshamenk reached sexual maturity in 1997 and impregnated Belen in 1998. After 16 months of pregnancy, Belen gave birth to a calf that was stillborn in 1999, Belen, died shortly afterwards, in February 2000 because of a severe kidney infection. Since the death of Bethlehem (Belen), the Wilderness Foundation WEF began to demand the release of Kshamenk to spare the same sad fate of his companion killer whales and many other victims of the captivity industry. 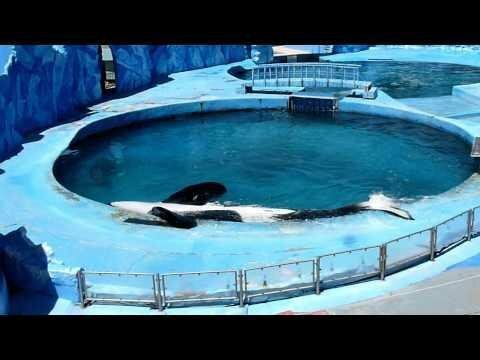 The enclosure is deteriorating this killer whale, victim of captivity, and now Kshamenk does not cooperate with his trainers, sexually frustrated, angry and depressed. We believe that Kshamenk is a very good candidate to reintegrate into the wild for various reasons. According to information we have, Kshamenk was between five and six years old at the time of capture, which means he had several years to gain the experience necessary to survive in the wild, feeding on their own, navigating , communicate and use their sonar. Kshamenk is hostile to the trainer. In fact, wants nothing to do with people. The fact that Kshamenk has not developed ties with humans during his time in captivity, and foster their reintegration into the wild. Unlike other captive orcas we know of, orca Kshamenk is not a resident orca. Kshamenk orca is a transient orca and, for all we know, one of the few transient orcas in captivity in the world. This means that Kshamenk could join another group if only his pack original, and has a great ability to connect with several of the transient orcas that frequent the site chosen for rehabilitation and release. Kshamenk will swim more than 500 turns per hour in his pool which is much smaller than the size you need for a whale this size.